As many schools adopt a nut-free school lunch policy, sending your kids off with a PB&J sandwich is no longer an option. 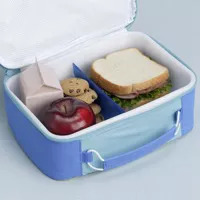 Instead, parents face the daunting task of filling the lunchbox with items that are nutritious and tasty as well as nut-free. So how do you keep your kids happy and healthy without going nuts? If possible, try to plan ahead. Last night's chicken dinner or turkey burgers can make for healthy nut-free lunch options. Also, when you begin packing nut-free lunches, allow yourself some extra time at the grocery store to identify nut-free breads and other appropriate snack items. Eventually, buying these brands will become habitual. Sunflower seed butter. This is a tasty peanut butter alternative. Like peanut butter, sunflower seed butter is high in calories and fat, but most of the fat is the heart-healthy unsaturated kind. In addition, sunflower seed butter is high in protein and high in fiber. Spread some of your child's favorite nut-free bread for an easy and tasty lunchtime sandwich. Make sure to read the label carefully to make sure that the brand you choose is not made on equipment shared with other nuts. McDonald's 400 Calorie Menu: Love it or Lose it? Yogurt. Since calcium is so important for healthy development, yogurt should play a big role in your child's diet. Adding a low-fat, low-sugar yogurt to their lunch not only ups their calcium intake but also provides a good amount of protein to their meal. Many yogurts that are marketed to children are high in sugar, so make sure to carefully read the labels when buying yogurt for your family. Aim for a yogurt that averages close to two grams of sugar per ounce (that's the natural amount of sugar that comes from the lactose in the yogurt). Turkey slices. Turkey is an easy option for a low-fat protein source. If you are struggling to find nut-free bread that your kids like, make it fun and spread some honey mustard on the turkey and roll some cheese and veggies inside for added calcium and vitamins. Look for low-sodium turkey made without nitrates. Hard boiled eggs. Eggs are a nutritional powerhouse and an easy staple to keep in the house. Not only are they high in protein, but they contain many of the essential vitamins and minerals that are important for healthy development. If possible, try and buy organic eggs to avoid added hormones. And of course, load up on fruits and vegetables! Your kids will be happy and healthy at lunch. Samantha Linden is a registered dietitian and mother of two. Like many parents, she understands the positive impact a nutritious diet can have on a family's overall wellness. She believes good eating habits begin with educating parents. She also realizes that life is very busy and sometimes the ideal isn't always possible.